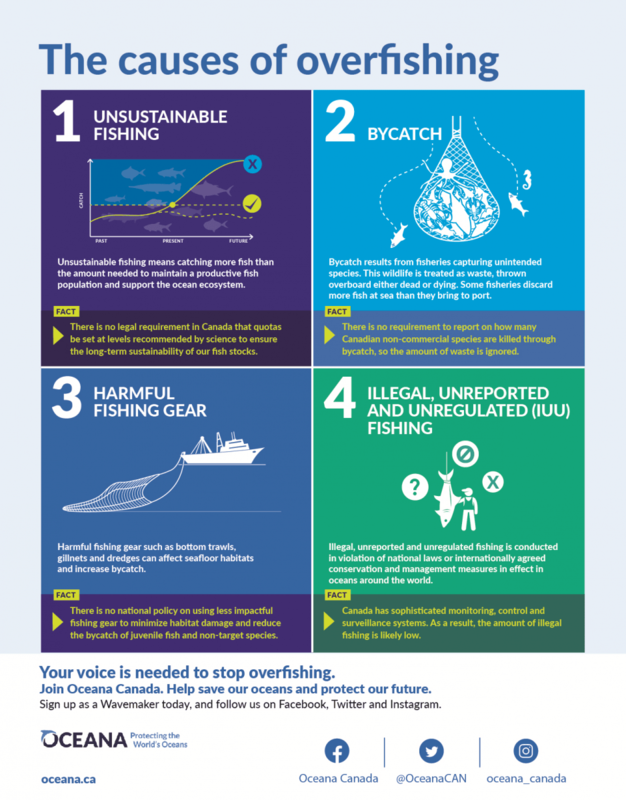 What's Causing Overfishing in Canada? While ecosystems are complicated, the math is simple. When you take more fish out of the ocean than the ocean can naturally replenish, the number of fish drops. Keep that up year after year and you’re laying the groundwork for a major crisis. Although the concept is simple, overfishing takes many forms. 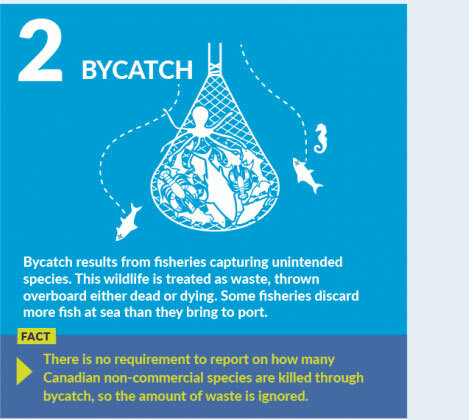 One is bycatch: the fish and other marine creatures that wind up in nets and lines set for other species or the fish that are too young to be legally caught. The culprit behind this is often non-selective fishing gear. 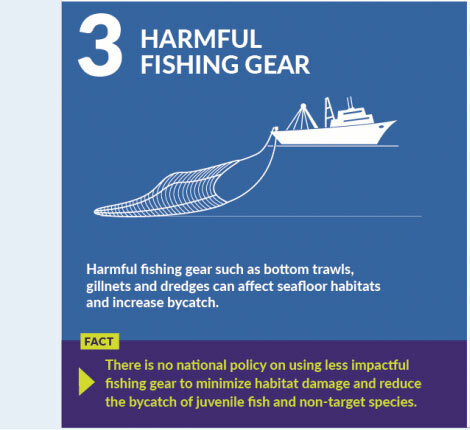 In a number of cases, alternatives exist that can help reduce the bycatch of juvenile fish and non-target species. 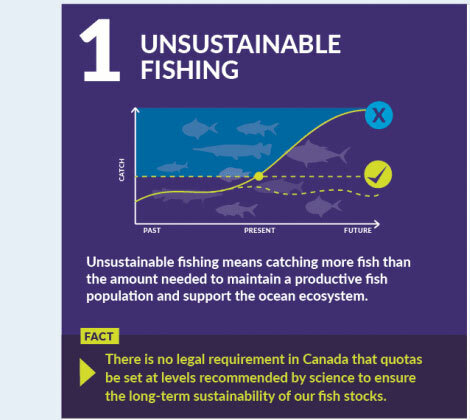 However, Canada has been slow to mandate low-impact gear in the majority of its fisheries. Moreover, although the Department of Fisheries Oceans has established a bycatch policy, it has not been fully implemented in a single fishery. Another key factor is setting the total allowable catch too high, often because of a failure to take into account the amount of fish caught as bycatch in other fisheries or because of significant conflict as to how a reduced quota should be allocated. In Canada, a lack of transparency creates situations where short-term commercial interests can take priority over long-term, science-based recovery planning. 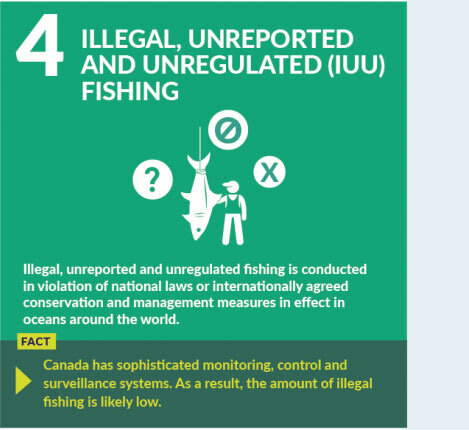 Rounding out the list of factors is illegal, unreported and unregulated fishing and climate change, all putting further pressure on Canada’s fish stocks.